This book is designed for a one-semester operating-systems course for advanced undergraduates and beginning graduate students. Prerequisites for the course generally include an introductory course on computer architecture and an advanced programming course. 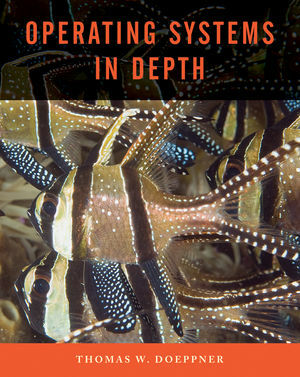 The book and its accompanying significant programming projects make students come to grips with current operating systems and their major operating-system components and to attain an intimate understanding of how they work. Professor Doeppner is an associate professor of computer science at Brown University. His research interests include mobile computing in education, mobile and ubiquitous computing, operating systems and distribution systems, parallel computing, and security. 1.2 A Brief History of Operating Systems. 1.4 Beyond a Simple OS. 6.1 The Basics of File Systems. 7.1 Memory Management in the Early Days. 7.2 Hardware Support for Virtual Memory. 9.2 Remote Procedure Call Protocols. 10.3 Common Internet File System (CIFS). Organization of Table of Contents helps make a comprehensive programming project possible. For example, Chapter 2 provides a full tutorial on how to write multithreaded programs, both using POSIX threads and Windows threads. Though the material covers such programming from an application-program perspective, both the concepts and the practice apply to programming within an operating system. Three types of end-of-chapter exercises provide plenty of practice. These include unstarred, starred, and two-starred problems that range from quick and easy review to challenging, exam type problems.